You thought you knew all there was to know about easy tacos, but I’m here to tell you there is an even easier way. You won’t believe it when you read it, and you’ll kick yourself for not having thought of it on your own. But before I reveal the secret to the most amazingly easy tacos ever, I want to wet your appetite for an amazing resource that will be available on the blog soon is available on the blog NOW. 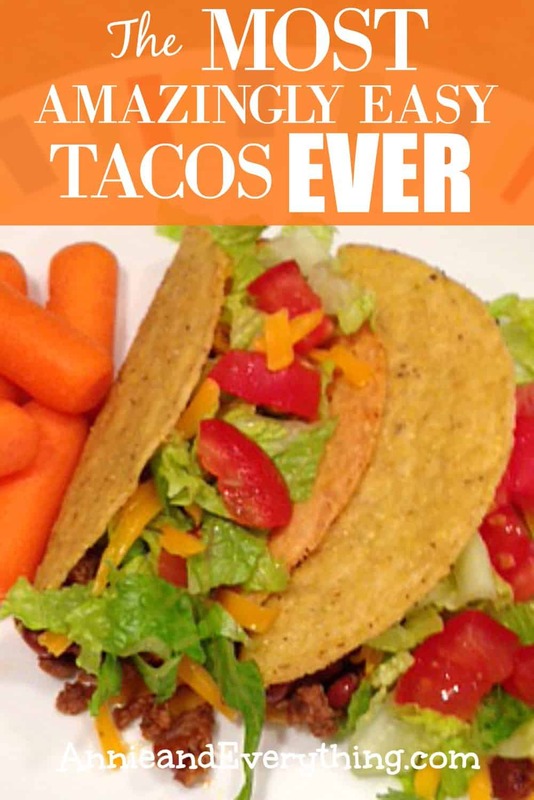 🙂 If you like the taco recipe, you will LOVE my new printable list of 30+ Ridiculously Easy Dinners for Busy Families on a Budget. These are recipes for dinner entrées that are not only quick to put on the table, they are also inexpensive and use only ordinary ingredients. This list will effectively end dinner-time frustration with yummy meals that can be made and served within 30-45 minutes with NO advanced prep. 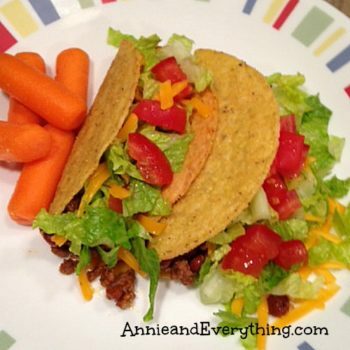 Trust me, you will want this resource on those evenings when you have come home after a long day and are fresh out of ideas, but the kids are hungry and the hubby will be home soon. But the trick is that 30+ Ridiculously Easy Dinners for Busy Families on a Budget is only available to subscribers to my email newsletter. But that’s easy to fix! For more details, click here: 30+Ridiculously Easy Dinners — or just put your email in the box at the bottom of this page for instant access and to become a subscriber! Brown a pound of ground beef. Drain. 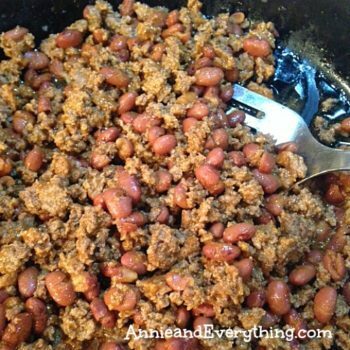 Stir in a can of chili beans and simmer until hot. Done. And I know you already know how to grate cheese and chop lettuce and tomatoes. So then you warm the taco shells in the oven as per the package directions and fill them with the meat mixture and all the trimmings — which you also already knew. But you don’t know, until you try them, how yummy these are. They are a hit with my family! Who doesn’t love tacos? Well, whoever doesn’t will still love these!! LOL.